Take on the House - Your House. It's the biggest, baddest collection of casino gaming ever! Host the ultimate casino night in the comfort of your home - Friends and family will revel in the high stakes action all night long. 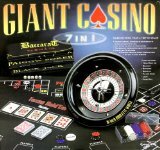 This complete 7-in-1 Giant Casino game set includes everything you need to host your own casino party at home or at work. Oversized, smooth-turning 16" roulette wheel, 100 regulation size suited chips in 4 colors, 6 2ft x 4ft casino game felt layouts for Texas Holdem poker, blackjack, roulette, craps, baccarat, and Pai Gow poker, craps dice and rake plus on/off button, poker delaer button, poker dice, and 2 decks of poker playing cards all in the box.